This picture was taken on Holland Road in Montague County. Firefighters in Texas faced calmer conditions Saturday as they worked to contain deadly wind-driven wildfires, but there was concern that the weather could again play havoc with the situation. Bill Beebe, a spokesman for the Texas Forest Service, said things were "pretty quiet," even though more than 122,000 burning acres had not been contained by firefighters, including two new fires in East Texas. The major worry was that lightning from thunderstorms predicted for Sunday could ignite additional fires, he said. "We're bracing possibly for some difficult times," he said. The National Weather Service said the threat of thunderstorms Sunday encompasses all of North Texas. Meantime, the Federal Emergency Management Agency said Saturday it has authorized the use of federal funds to help fight the fire in Palo Pinto County. The authorization makes FEMA funding available to pay 75 percent of eligible firefighting costs under an approved grant for managing, mitigating and controlling designated fires. "The heroic efforts of the firefighters have saved several thousand homes and countless lives," Gary Jones, acting FEMA regional administrator, said in a statement. "Working in cooperation, numerous volunteer organizations are helping individuals and families who have been affected." 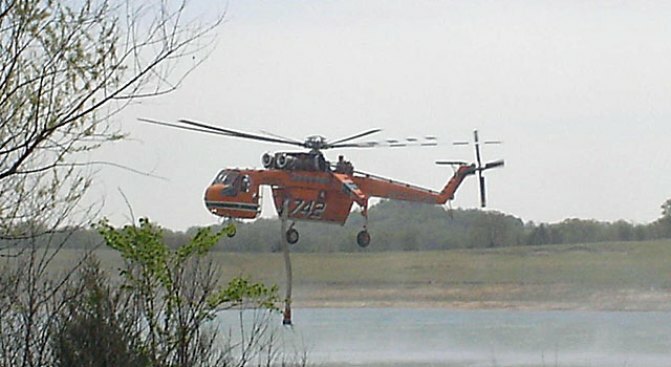 Firefighters reported that the Palo Pinto fire remains zero percent contained, Beebe said. The fire has burned 700 acres, destroyed 14 homes and threatened a total of 198 homes, he said. Among the locations threatened is the resort area of Possum Kingdom. A fire covering 25,000 acres in Montague County also was reported to be without any containment, Beebe said. Some percentage of containment has been reported for fires in Archer, Young, Jack and Stephens counties, he said. The two fires that developed Saturday were in Red River and Camp counties. Beebe said the fire in Red River County, which covers 200 acres, could prove tricky because timber in the area was subject to a recent freeze, killing it and making it more flammable. Three people died and more than 100 homes were destroyed by the fires -- at least one of them suspected of being intentionally set -- as they raged through western and central Oklahoma and North Texas on Thursday. The blazes eased Friday as wind diminished from the peak of up to 70 mph.